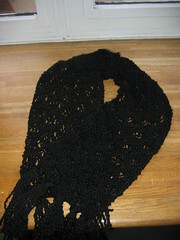 I was in quite a good mood last night, surely after finishing the scarf for my sister. She asked me this way before Christmas but there was no pressure. I started it quite soon, but then put it down and didn't pick it back up. Now my goal is to finish up all those projects for others and then say no for a while, at least against pressure stuff. There is nothing special about it. It's a regular black yarn (as she requested), 100% wool but no label (got it at my fave LYS, where most stuff is without a label), knitted on 6mm needles (I think), in an easy dropped stitch pattern. I used 3 balls for the scarf and part of a 4th for the fringe. It looks nice though I would have preferred making it smaller and longer. But I'm sure she'll like it. That being out of the way I got a big deal knitted on the socks for Mog! Yes dear, I haven't forgotten about you! I'm sure these'll be finished soon as I told myself I wasn't allowed to start the Norwegian stockings before your socks are done! I'll post a picture as soon as they are done. At least you'll have them before Winter arrives over there! The last group are things I am requested to finish but there is no rush. The socks are no problem really, I'll get to them. As for the cardigan, it's kinda a try out before I knit one for myself so that's the reason I don't mind knitting this! The one for me - along with the Butterfly dress from Rowan - needs to be done by July for a wedding, so I'll get started on them soon. Now I have to admit that I am getting tired of the knitting for others, especially because of the pressure and the lack of respect (and that doesn't include those I'm knitting for as for swaps as I know they respect the time and efford I put in my stuff). I want to knit so many things for myself but I don't get around. Luckily it's slowly getting Summer over here and I'm sure the request for knitted items will be down big time, so then I can knit for myself! I can never go without knitted items as I'm always cold, also during Winter. Next up of course are also the Sockapaloooza socks! I've been thinking about them. I've debated between some nice self colouring (not really self striping) sock yarn with an easy pattern, like the Dublin Lace, or some mosaic pattern with handpainted and a solid yarn. I like the idea of the last one as I LOVE knitting mosaic and I can't wait to knit another pair for myself (it's a good way to use up left overs of handpainted sock yarn if you ask me!). So I think I'm going to go with the last idea. I need to dye up the yarn then, so I'm thinking of doing all of this coming Monday. Still have to think about the colours though! I have another dilemma though. I am going to order some Debbie Bliss Cashmerino. Now I am doubting what to order as I'm doubting what to knit with it. It's either Tubey from Knitty but then probably in a solid colour. Or the sweater from the Cashmere duo from Knitscene (#13). I just don't know, so please, give me your opinion! I do need to order quickly, as I also want to order some Rowan Polar before they run out! Going now, more knitting to do!